U.S. Army representatives have highlighted the delivery of a new combat capability into Afghanistan in time for that theater’s traditional “spring fighting season.” The new capability comes in the form of the XM1156 Precision Guidance Kit (PGK) that will provide conventional M777A2 towed 155mm artillery with “near-precision” munitions delivery. By way of comparison, Army sources identify the Circular Error Probable (CEP) for conventional M549A1 155mm artillery projectiles at maximum range to be 267 meters – meaning that half of the rounds fired can be expected to strike within a 267-meter radius of the target. It’s clear from the CEP data that the application of “dumb” artillery projectiles would be extremely limited in built-up areas or with friendly forces in close contact with the enemy. One solution to this dilemma has been the XM982 155mm “Excalibur” precision-guided extended range projectile. A co-development program between Raytheon and BAE Bofors, Excalibur was first fielded in 2007 and uses GPS precision guidance technology to achieve a radial miss distance of six meters from the target. The projectile’s capabilities have been thoroughly combat-proven in both Iraq and Afghanistan. However, in a reflection of both large inventories of conventional “dumb” projectiles and cost considerations for precision munitions, the fire support community entered the 21st century exploring specific needs for “precision fires” versus needs for varying levels of “accurate” fires. Those explorations helped pave the way for development of PGK and the related terminology of “near precision” capabilities. PGK is a global positioning system guidance kit with fuzing functions that enhances the U.S. Army’s conventional stockpile of 155mm high explosive M549A1 and M795 cannon artillery projectiles to less than 50 meters CEP, regardless of range to the target. Soldiers install the PGK fuze into the fuze well of conventional 155 mm high explosive M549A1 and M795 cannon artillery projectiles, replacing the standard fuze. This allows troops to turn their conventional artillery rounds into “smart” munitions. Soldiers from field artillery units will set PGK using the Enhanced Portable Inductive Artillery Fuze Setter (EPIAFS). Once the fuze is set, the shell is loaded in the same fashion standard 155 mm rounds are loaded. Once fired, the fuze uses accurate position data from satellites to adjust the round’s guidance canards to “steer the round” to the target. In addition to reducing the number of projectiles required to hit targets, which in turn reduces collateral damage and risk to civilians, the PGK design also incorporates a “fail safe” option, where the PGK equipped artillery round will not detonate if it does not get close enough to the target. 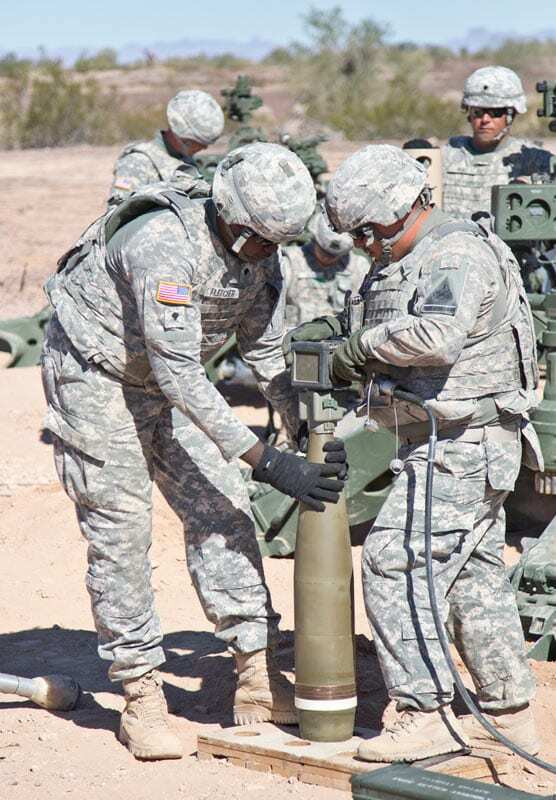 Late last year, soldiers from the U.S. Army’s 4th Battalion, 27th Field Artillery Regiment, based at Fort Bliss, Texas, became the first troops to fire the XM1156 during tests at Yuma Proving Grounds, Ariz. The unit fired 24 PGK-equipped projectiles during that testing as part of digital fire missions from the forward observer, through the fire direction center, to the weapon system. Twenty of these rounds were in support of an Early User Assessment EUA and other testing for the kit. That testing helped pave the way for initial fielding of the PGK through an Urgent Materiel Release process. The Army began delivering the PGK to soldiers in Afghanistan, coupled with new equipment training (NET), in March of this year. The first successful firing in training took place on April 2. Army sources note that initial fielding will be complete by the end of June. The prime contractor for PGK is Alliant Techsystems (ATK), which is contracted to produce and deliver approximately 2,400 XM1156 PGKs for the U.S. Army and 700 for the U.S. Marine Corps.